Authors: Ahmadi, Sh. and Mostafapour, F. K.
Ahmadi, Sh. and Mostafapour, F. K. (2017). Adsorptive removal of aniline from aqueous solutions by Pistacia atlantica (Baneh) shells: isotherm and kinetic studies. Journal of Science, Technology and Environment Informatics, 05(01), 327-335. Ahmadi, Sh. and Mostafapour, F. K. “Adsorptive removal of aniline from aqueous solutions by Pistacia atlantica (Baneh) shells: isotherm and kinetic studies” Journal of Science, Technology and Environment Informatics, 05.01 (2017): 327-335. Ahmadi, Sh. and Mostafapour, F. K. “Adsorptive removal of aniline from aqueous solutions by Pistacia atlantica (Baneh) shells: isotherm and kinetic studies.“ Journal of Science, Technology and Environment Informatics, 05, no. 01 (2017): 327-335. Authors: Afreen, S., Rahman, M. M., Islam, M. M. U., Hasan, M. and Islam, A. K. M. S.
Abstract: The experiment was conducted at the Sher-e-Bangla Agricultural University, Dhaka during the Rabi Season 2013-14 to study the effects of different planting dates and mechanical support for the management of insect pests in tomato. The experiment was laid out in Randomized Complete Block Design (RCBD) with three replications consisted of nine treatments. Significant variations were found among the treatment. At early fruiting stage of tomato in number and weight basis, the highest percentage of infested fruit (10.65% and 10.99%) was recorded in T7 treatment, while the lowest (2.67% and 4.35%) in T5 treatment. At mid fruiting stage of tomato in number and weight basis, the highest percentage of infested fruit (11.92% and 12.62%) was recorded in T7 treatment, while the lowest (3.13% and 4.50%) in T5 treatment. At late fruiting stage of tomato in number and weight basis, the highest percentage of infested fruit (10.15% and 10.66%) was recorded in T7 treatment, whereas the lowest (2.22% and 4.21%) in T5 treatment. At total fruiting stage of tomato in number and weight basis, the highest percentage of infested fruit (10.93% and 11.43%) was recorded in T7 treatment, whereas the lowest (2.66% and 4.35%) in T5 treatment. The highest fruit yield (55.91 t ha-1) was recorded in T5, whereas the lowest yield (45.39 t ha-1) in T7 treatment. Planting at 10 December with the method of Horizontal mechanical support was more effective for reduction of insect pest of tomato and also for highest yield. Afreen, S., Rahman, M. M., Islam, M. M. U., Hasan, M. and Islam, A. K. M. S. (2017). Management of insect pests in tomato (Solanum lycopersicum L.) under different planting dates and mechanical support. Journal of Science, Technology and Environment Informatics, 05(01), 336-346. Afreen, S., Rahman, M. M., Islam, M. M. U., Hasan, M. and Islam, A. K. M. S. “Management of insect pests in tomato (Solanum lycopersicum L.) under different planting dates and mechanical support.” Journal of Science, Technology and Environment Informatics, 05.01 (2017): 336-346. Afreen, S., Rahman, M. M., Islam, M. M. U., Hasan, M. and Islam, A. K. M. S. Management of insect pests in tomato (Solanum lycopersicum L.) under different planting dates and mechanical support. Journal of Science, Technology and Environment Informatics, 05, no. 01 (2017): 336-346. Authors: Hafizur, R. M., Nuralam, H. M. and Rumainul, I. M.
Abstract: Industrial effluent (IE) is one of the major concerns in environmental issues due to its hazardous and chemical nature that is require on-site treatment and systematic management before discharge into sewage system. Therefore, the aim of this study was to investigate in order to determine the present pollution status and their alteration trends with the seasonal change of discharge amount. Water samples have been collected from Turag River adjacent to Konabari industrial area and analyzed for various water quality parameters during both dry and wet seasons. Physicochemical analyses revealed that, most of the water quality parameters exceeded the recommended levels set by the Department of Environment (DoE), Bangladesh. The dry season had significantly higher contamination loads, which were decreased during the wet season, as the river was found to be highly turbid in wet season. Furthermore, all of the dissolved metals in the water samples were also found to be significantly higher in concentrations during dry season, but still remain under the limit of recommended standards of DoE, Bangladesh, except the concentration of Cadmium in dry season. To conclude, the variation in river water flow during different seasons and the anthropogenic activities were the main reasons for this water pollution of Turag River. Hafizur, R. M., Nuralam, H. M. and Rumainul, I. M. (2017). Investigation of physicochemical parameter, heavy metal in Turag river water and adjacent industrial effluent in Bangladesh. 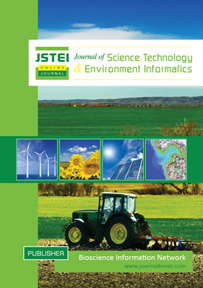 Journal of Science, Technology and Environment Informatics, 05(01), 347-360. Hafizur, R. M., Nuralam, H. M. and Rumainul, I. M. “Investigation of physicochemical parameter, heavy metal in Turag river water and adjacent industrial effluent in Bangladesh.” Journal of Science, Technology and Environment Informatics, 05.01 (2017): 347-360. Hafizur, R. M., Nuralam, H. M. and Rumainul, I. M. Investigation of physicochemical parameter, heavy metal in Turag river water and adjacent industrial effluent in Bangladesh. Journal of Science, Technology and Environment Informatics, 05, no. 01 (2017): 347-360. Authors: Ghosh, S. R. and Waheed, S.
Abstract: Now a days liver disease is extending markedly due to excessive alcohol consumption, smoking, drinking arsenic contaminated water, obesity, low immunity and by inheritance. Liver cancer symptoms may include jaundice, abdominal pain, fatigue, nausea, vomiting, back pain, abdominal swelling, weight loss, general itching. Selective algorithms may be used on medical instruments (e.g. CT scanner, MRI, Ultra sono, ECG etc.) to lessen time and cost on hepatic disease diagnosis. Here some of the algorithms such as, Naive Bayes classification (NBC), Bagging, KStar, Logistic and REP tree were used to evaluate the accuracy, precision, sensitivity and specificity. For these two data sets of UCLA and AP were considered to find out the best algorithm. The whole analysis was done using the software Weka 3.6.10. It was revealed that, KStar algorithm had the maximum accuracy, precision, sensitivity and specificity. On the other, minimum accuracy was obtained from NBC. Therefore K* algorithm can be used on diagnosis tools or instruments for rapid identification of specific liver disorder. Ghosh, S. R. and Waheed, S. (2017). Analysis of classification algorithms for liver disease diagnosis. Journal of Science, Technology and Environment Informatics, 05(01), 361-3270. Ghosh, S. R. and Waheed, S. “Analysis of classification algorithms for liver disease diagnosis”. Journal of Science, Technology and Environment Informatics, 05.01 (2017): 361-370. Ghosh, S. R. and Waheed, S. “Analysis of classification algorithms for liver disease diagnosis”. Journal of Science, Technology and Environment Informatics, 05, no. 01 (2017): 361-370. Authors: Iva, T. T., Hazra, P., Faisal, M., Saha, S. and Hossain, S.
Authors: Igwe, C. E., Azorji, J. N. and Iheagwam, S. K.
Abstract: There is a rule among cosmetic formulators of not mixing an anionic surfactant with a cationic surfactant in the same formulation, especially if it’s a clear product, since this interaction will result in the appearance of turbidity (precipitation). Nevertheless, vast reports show not only the possible but also synergistic combination of surfactants with opposed charge, conferring unique properties to the final product. The aim of this study is to evaluate the use of a co-surfactant as a novel tool for maintaining high levels of both cationic and anionic surfactants mixed in the same product, without precipitation. Not only we found this possible at certain rates, but also attributes of the system such as viscosity, detergency and foam stability, were improved. Caracciolo, W. C. (2017). Advances in shampoo formulation: synergism of anionic/ cationic/ zwitterionic surfactant ternary system. Journal of Science, Technology and Environment Informatics, 05(02), 389-394. Caracciolo, W. C. “Advances in shampoo formulation: synergism of anionic/ cationic/ zwitterionic surfactant ternary system.” Journal of Science, Technology and Environment Informatics, 05.02 (2017): 389-394. Caracciolo, W. C. Advances in shampoo formulation: synergism of anionic/ cationic/ zwitterionic surfactant ternary system. Journal of Science, Technology and Environment Informatics, 05, no. 02 (2017): 389-394. Authors: M. A. Hoque and K. K. Saha. Authors: Islam, A. K. M. S., Kabir, M. S. and Hossain, M. I. Authors: Tamanna, K., Rahman, A. N. M. A. and Rabbani, M. A.
Abstract: Two types of rice transplanter model were hired to conduct the experiment at Bangladesh Agricultural University (BAU), Mymensingh in May-June, 2014 for Aman season to evaluate their comparative performances. Both the transplanters were tested in the departmental laboratory and in the field. During off-field test on concrete, the seedling per hill at high, medium and low position of seedling density controller was found 7, 5 and 4 in ARP-4UM model and it was14.3%, 20%, and 50% less in the DP 480 model compared to ARP-4UM model. During in field test the seedling per hill at high position of seedling density controller was found to be same in ARP-4UM model and DP 480 model but for medium and low position the seedling per hill was 6,3 and 1 in DP 480 model which was 25% and 50% more in ARP-4UM compared to DP 480 model. After the experiment, the transplanting depth for shallow, standard and deeper position of depth controller was found 2.39, 3.89 and 6.42 in DP 480 model and it was 10.3%, 6.9% and 30.99% less in ARP-4UM. On an average the percent of skidding was found 12.3% in DP 480 model and 16.2% in ARP-4UM model at the 15cm prefixed position of the plant to plant distance controller. Percent of missing hill in 120cm×200cm was found 4.35% in ARP-4UM model and 2.18% in DP 480 model. The field capacity was found 0.2052 ha/hr in DP 480 model and 0.1801 ha/hr in ARP-4UM model. The amount of Fuel consumed in ARP-4UM Model was obtained 1.43 lit/ha and in DP 480 Model rice transplanter it was 1.57 lit/ha. After calculating all the parameters related to the performance of the rice transplanter it was found that the DP 480 model was better compared to the ARP-4UM model in terms of break-even analysis. Tamanna, K., Rahman, A. N. M. A. and Rabbani, M. A. (2018). Comparative performance evaluation of DP 480 model and ARP-4UM rice transplanter. Journal of Science, Technology and Environment Informatics, 05(02), 413-420. Tamanna, K., Rahman, A. N. M. A. and Rabbani, M. A. “Comparative performance evaluation of DP 480 model and ARP-4UM rice transplanter.” Journal of Science, Technology and Environment Informatics, 05.02 (2018): 413-420. Tamanna, K., Rahman, A. N. M. A. and Rabbani, M. A. “Comparative performance evaluation of DP 480 model and ARP-4UM rice transplanter.” Journal of Science, Technology and Environment Informatics, 05, no. 02 (2018): 413-420.